Having access to the outdoors is sometimes taken for gtranted. 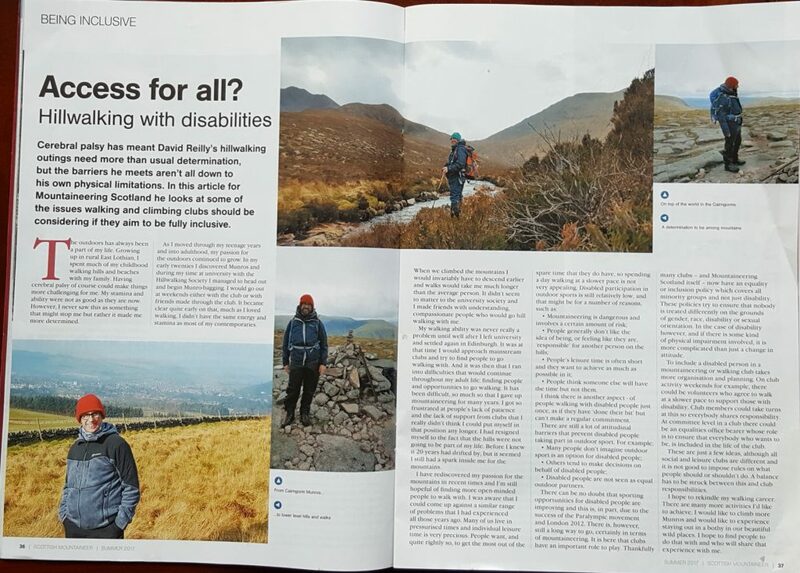 However for disabled people finding oppotunities to spend time in the wilderness can be more difficult. I was lucky enought to writte this article for Mountaineering Sotland Magazine and share a bit of my expereince. The outdoors have always been a part of my life. Growing up in rural East Lothian, I spent much of my childhood walking hills and beaches with my family. Having Cerebral Palsy of course could make things more challenging for me. My stamina and ability was not as good as it is now. However, I never saw this as something that might stop me but rather just made me more determined. As I moved through my teenage years and into adulthood, my passion for the outdoors continued to grow. In my early twenties I discovered the Munros and during my time at University with the Hillwalking Society I managed to head out and begin Munro bagging. I would go out at weekends either with the club or with friends made through the club. It became clear quite early on that, much as I loved walking, I didn’t have the same energy and stamina as most of my contemporaries. When we climbed the mountains I would invariably have to descend earlier and walks would take me much longer than the average person. I didn’t seem to matter to the University society and I made friends with understanding, compassionate people who would accompany me hill walking. My walking ability was never really a problem until well after I left university and settled again in Edinburgh. It was at that time I would approach mainstream clubs and try to find people to go walking with. It was then that I ran into difficulties and one that would continue throughout my adult life. Finding people and opportunities to go walking has been difficult and, so much so, I gave up mountaineering for many years. I got so frustrated at people’s lack of patience and lack of support from clubs that I really didn’t think I could put myself in that position any longer. I had resigned myself to the fact that the Mountains were not going to be part of my life. Before I knew it 20 years had drifted by but, unbeknown to me, I still had a spark inside me for the mountains. Mountaineering is dangerous and involves a certain amount of risk. People generally don’t like the idea of being, or feeling like they are, ‘responsible’ for another person on the hills. Peoples’ leisure time is often short and they want to achieve as much as possible in it. People always think someone else will have the time but not them. There can be no doubt that sporting opportunities for disabled people are improving and this is, in part, due to the success of the Paralympic movement and London 2012. There is, however, still a long way to go in terms of outdoor sport and mountaineering. It is here that clubs have an important role to play. Thankfully many clubs now have an equality or inclusion policy which covers all minority groups and not just disability. These policies try to insure that nobody is treated differently on the grounds of gender, race, disability or sexual orientation. In the case of disability however, and if there is some kind of physical impairment involved, such as in the case of disability, it is more complicated than just a change in attitude. To include a disabled person in a mountaineering or walking club, its takes more organisation and planning. On club activity weekends for example, there could be volunteers who agree to walk at a slower pace to support those with disability. Club members could take turns at this so everybody shares responsibility. At committee level in a club there ought to be an equalities office bearer whose role is to ensure that everybody who wants to be, is included in the life of the club. These are just a few ideas although with any social or leisure club, it is not good to impose rules of what people must do. However a balance has to be struck between this and club responsibilities. I hope to rekindle my walking career again. There are many more activities I’d like to achieve. I would like to climb more Munros and would like to experience staying out in a bothy in our beautiful wild places. I hope to find people to do that with who will share that experience with me.